When learning how to make green bean salad recipes, many also will include yellow wax beans. Both the green and yellow are much alike growing on bushes and having very similar taste. There are many varieties of just the “green” bean alone; all of which can be used in green bean salad recipes. The oldest versions of green beans (and still very popular) are ones which have long strings running down the sides of the beans. Although these are known for their wonderful flavor, my mother hated these beans. Dad use to grow some of these in his garden and I can still remember how Mom complained about these “strings” when trying to clean them. If you cook them without removing “all” the strings, they can be very annoying. It was close to the nineteen hundreds that the “stringless” green bean was developed. These became more common in most part of the country because the convenience in the cleaning. I believe (not sure) that the exception to this might be the Southern United States. It seems to me that I talk to more people in this area cooking the string beans over the stringless. When learning how to make green bean salad recipes, after cleaning fresh beans, it only takes a little steaming or cooking before cooling and using in the recipes. Crisply frozen green and yellow beans from the grocery store are very convenient to make your recipes. Although the beans will not be as crisp as steamed fresh ones, all kinds of canned beans are available at your local grocery. These are also very good and very convenient to use. Cook bacon until crisp, crumble and set aside. Place green beans and mushrooms in a large bowl. Add the onion, blue cheese, bacon, garlic powder, salt and pepper. Blend in the sour cream thoroughly. Top mixture with the shredded cheese. Cover and refrigerate until ready to serve. This bean salad recipe is loaded with other vegetables. With a vinegar and oil salad dressing, it is great to take on a summertime picnic; you need not worry about it spoiling like a creamy salad dressing recipe. 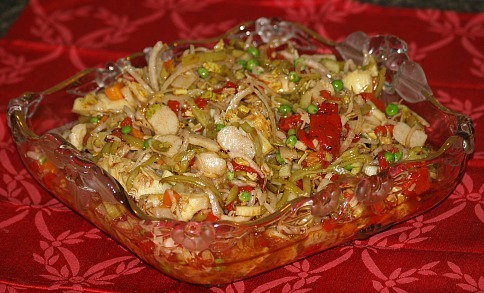 Drain all canned vegetables and blend together in a large bowl; add the peas, celery and onion and mix in. Combine the vinegar, oil, sugar, cinnamon, salt and pepper; mix well to blend and pour over vegetables. In a large bowl blend sugar, sugar, oil and vinegar. Add salt, beans and onion; toss to coat thoroughly. In small bowl combine oil, vinegar and seasonings; pour over vegetable mixture. Season with salt and pepper; add anchovies and toss to coat and serve. 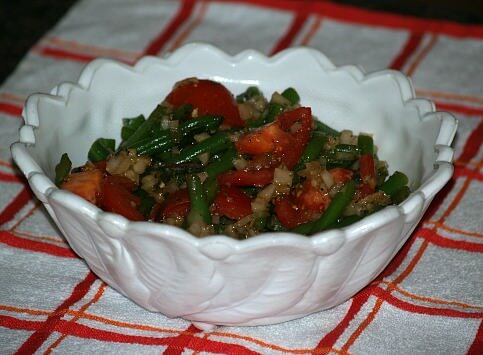 Learn how to make this green bean salad recipe; it is very flavorful with Italian seasoning. Drop green beans into boiling water; cook about 15 minutes. Drain beans; run cold water over beans to cool. Combine vinegar, oil and seasonings in a large bowl; blend well. Add tomatoes and green beans to oil mixture; toss lightly to coat.